Start this Chocolate Bliss Cheesecake with an OREO Cookie crust! 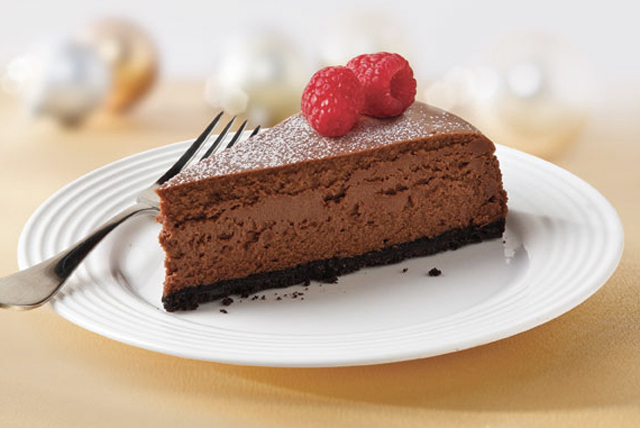 This Chocolate Bliss Cheesecake has whipped chocolate goodness in every bite. Mix cookie crumbs and butter; press onto bottom of 9-inch springform pan. Beat cream cheese, sugar and vanilla with mixer until blended. Add chocolate; mix well. Add eggs, 1 at a time, mixing on low speed after each just until blended; pour over crust. If using a dark nonstick springform pan, reduce oven temperature to 300ºF. Dust entire surface of cooled cheesecake with unsweetened cocoa powder using a wire mesh strainer, if desired. For a festive Valentine's Day garnish, create a heart-shaped design by topping dusted cheesecake with a heart-shaped stencil and sprinkling with powdered sugar. Use bottom of clean drinking glass to evenly press cookie crumb mixture onto bottom of springform pan. Garnish with powdered sugar, and fresh strawberries and/or raspberries just before serving.